A file with .pdf file extension is called Portable Document Format(PDF) file. Nowadays businesses and government agencies around the world use Portable Document Format(PDF) as a standard format for exchanging documents more securely. PDF File format allows us a page-by-page view of documents, exactly as they appear in their printed form. There is a usual question that how to read data from a database using sql statements and write that data to a PDF document. PDFsharp is an open source library that allows developers to create and manipulate PDF documents. PDFsharp enables developers looking to enhance their applications with dynamic PDF document creation and manipulation. 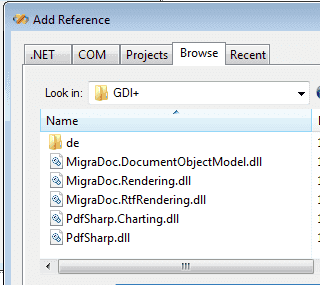 After download the zip file, extract it and add the reference to your vb.net project. Before creating PDF file we should read the data from database using sql query string. So we should create and initialize a connection string and sql statement. connetionString = "Data Source=YourServerName;Initial Catalog=pubs;User ID=sa;Password=zen412" sql = "select pub_name,city,country from publishers"
After make the connection, select the data from database using sql query and store it in a Dataset. Now we have data from the database, next step is to create and initialize Pdfsharp object to crate a new pdf file for writing the retrieved data. Now you can write the data to the pdf file. 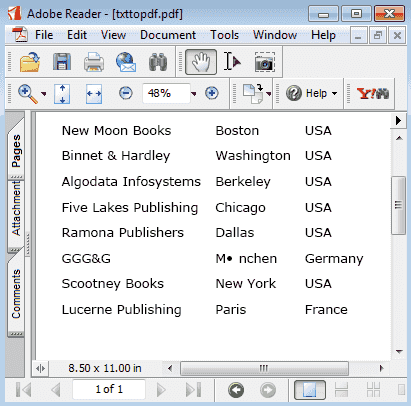 After write the data to the pdf file you should save the file with .pdf extension. Now you can open the newly created pdf file, the output is look like the following picture. The following VB.Net source code shows how to retrieve the data from database and write to the pdf file. connetionString = "Data Source=YourServerName;Initial Catalog=pubs;User ID=sa;Password=zen412"
sql = "select pub_name,city,country from publishers"
pdf.Info.Title = "Database to PDF"
Dim pdfFilename As String = "dbtopdf.pdf"